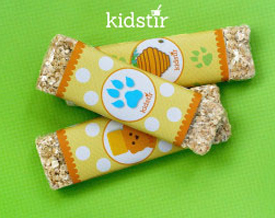 Wrap up your Honey Bear Bars from the Snack Happy kit in plastic wrap or foil. Then cut out the wrappers along the dotted lines. Wrap your bars with the illustration circle in the center (see picture!). Tape them closed on the back. Next post: Eat a rainbow!